I always like to spend some time each year writing up a reflection blog post. It’s something I love doing – I’ve always been one for reflecting and I think it’s really important that we all take some time to sit back and appreciate everything that we’ve done. 2018 was another whirlwind of a year for me, a hell of a lot happened, so let’s get into it shall we? 2018 started with me heading back to university in Norwich. My dissertation was submitted and I truly felt like I’d done the best I could do, I worked extra hard before the Christmas break so I had some time to truly relax. Submitting my dissertation was a massive thing – it’s what I’d been most nervous about going to university, and somehow I’d done it, and done it on my own. January was also the month I decided to really commit to blogging, and was the month I saw a real income come through. I worked with a number of brands and realised there was something really in this whole blogging thing. Although I wasn’t earning thousands, I had earnt hundreds – which was the perfect addition while full-time studying. Along the blogging theme, I also celebrated 5 years blogging – how crazy is that? I feel proud that I’ve managed to keep this thing going for so long, and creating something I truly am proud of. February and March were quieter months. I carried on working away at uni. For Valentines, I treated Jamie to a surprise trip away to Nottingham. I booked a cheap Airbnb and we spent the weekend exploring a city I fell in love with years ago – it was nice to finally share that with him. April saw me break up for Easter at university, and also saw me go on tour with the Netball girls. For me this was a pretty big thing – a weekend abroad in Croatia partying was something I always wanted to do but knowing I wasn’t a big party gal (don’t get me wrong, I love a boozy night out, I just struggle when there’s more than one in a short amount of time!) Although it was nothing for a lot of people, the trip made me feel nervous, anxious and I doubted whether I should have signed myself up for it. Despite it being a bit of a disaster, I’m still really proud I put myself out of my comfort zone, and I had an epic time with my netball bezzies regardless. Returning home from Croatia with the WORST FLU I’VE EVER HAD (literally, I felt like I was on my death bed), my mum, Jamie and I went to see Sam Smith at the O2. I felt awful but the night truly was magical. Bday month!!!!! May was a lot of fun. I finished university, thanks to my sensible choice of modules meaning no exams, I celebrated by 21st, and I had a few interviews for grad jobs. There were a lot of emotions.. that’s for sure. Starting with my birthday, my 21st was truly magical. I decided to celebrate it with a weekend at Centre Parcs with my family. It was the loveliest gift – far better than anything material, just getting to spend time together and make some memories was perfect. Jamie won the best boyfriend EVER award with my birthday gift.. he’d only gone and booked 5 days in New York City without me knowing a thing about it. It was the most amazing surprise ever. I usually end up working out what Jamie’s getting me for Christmas or Birthdays, but I was completely clueless that he had organised for something so incredible. While May was truly amazing, I struggled at times knowing I had finished university (for ever) and had to find a job. I was applying to jobs and starting to panic whether I’d find anything. It was a difficult time trying to work out my place in the real world. As summer got into full spring, I had some more exciting months planned. In June my coursemates and I headed to Prague for a few days as an end of uni celebration. It was fun to do something with people I’d met at uni, and to explore a new city on our own. While I was in Prague I also found out I’d been accepted for a job as a Digital Marketing Co-ordinator. Something I truly couldn’t believe.. and my blog was one of the main reasons I won the position – who’d have thought it?! August and September were more busy months. Jamie’s 21st was in August, so I treated him with a weekend of surprises in London. Junkyard golf club, a fancy meal out and a trip to see School of Rock the musical – it was a fun weekend of spoiling him. September rolled around and it was finally time for Jamie and I’s trip to New York City and oh my god was it magical. It truly was the most jam-packed 5 days full of exploring, laughing and making memories with my best friend. We’re already planning our next trip out there. And that brings us to the last few months of the year… These definitely acted as the wind-down months to an incredible year. October and November were very much months of ‘keep on keeping on’. Jamie and I saw Mumford and Sons in November, and earlier this month mum and I headed to Bath for a little get-away, but other than that, it’s been pretty quiet. And now we’re here. Ready and waiting for 2019. A hell of a lot happened in the last year. I graduated, I’m a real adult now, and I’ve grown into a whole new person. 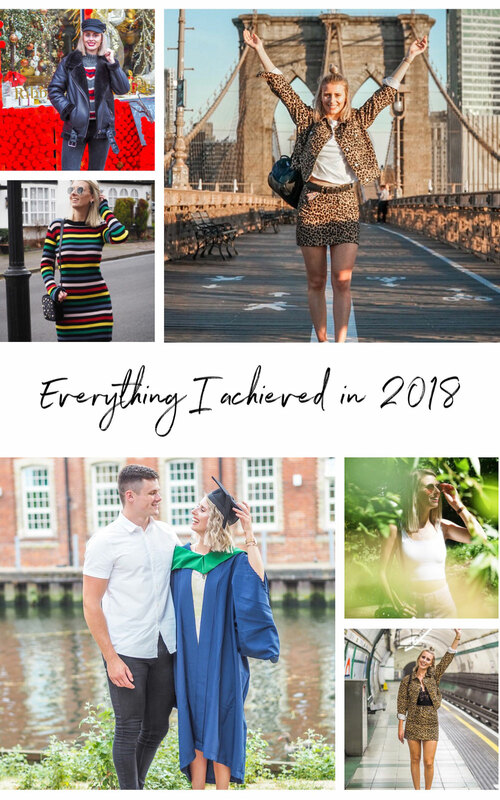 I am SO proud of all I achieve and continue to do so – let’s hope 2019 will continue in 2018’s footsteps..
"Let’s have a look forward to 2019, shall we?"